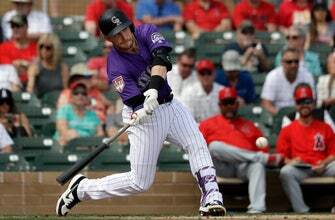 SCOTTSDALE, Ariz. (AP) — Trevor Story saw the Colorado Rockies‘ lineup and thought ahead to the regular season. “It gives you a little excitement, maybe a little preview,” the All-Star shortstop said after hitting a home run and getting a base hit in three at-bats Wednesday against the Arizona Diamondbacks. “I think we’re getting there, we feel like we’re heading in the right direction,” he said. If Story — fully healthy after right elbow pain threatened to sideline him late last season — can duplicate his 2018 success, the Rockies may be even more dangerous than last season’s 91-72 squad. “I want to strike out less,” said Story, who still struck out 162 times a year ago. The Diamondbacks’ Nick Ahmed won the Gold Glove for NL shortstops last year. But with Arenado and his six awards to Story’s immediate right, he doesn’t have to look far to see the possibilities. “It’s inspiring for sure. I see the work those guys have put in and it’s something I want to win,” Story said.